An Iraqi man has been arrested in Belgium in connection with a number of letters laced with toxic powders that were sent to the prime minister's office and the US and British embassies. A 45-year-old man was taken into custody in the western town of Deinze, police said. The arrest came a day after police said they were investigating 10 letters containing harmful powders. The chemicals included phenarsazine, an arsenic derivative used in rat poison, and hydrazine, used as a rocket propellant, the health ministry said. One report said hydrazine had also been used as an incapacitating gas during the two world wars. The letters contained only small amounts of the chemicals - not enough to be life-threatening, but capable of causing irritation to the eyes and skin. 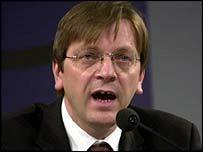 Five letters, including those to Prime Minister Guy Verhofstadt and the US embassy, were intercepted and the rest were delivered. Other targets included the Saudi embassy, three ministries, an airport in Ostend and a port authority in Antwerp. The discovery of the letters came during the third week of a trial of 23 suspected al-Qaeda members.